CORONADO, CA-The combined elements of water and fire can lead to an evening of relaxation and romance, and it’s all available now at the Hotel Del Coronado. With the beauty of America’s most beloved beach as a backdrop, sitting next to a granite fire pit table is a wonderful place to enjoy a cold beverage. 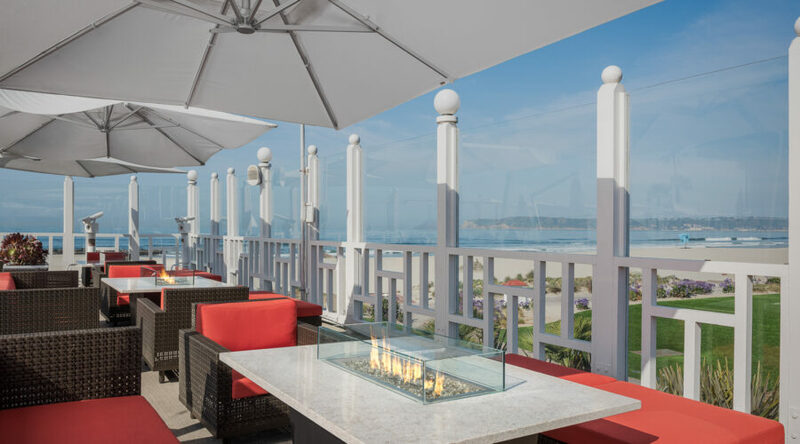 Located in Coronado, California, owners of the Hotel Del Corona do chose to add Newport Fire Pit tables by Cooke Furniture as accents next to their sun deck and sparkling pool. The tables were fully customized with Bianco Montanha granite tops and a custom height bronze coated stainless steel base. Imagine how relaxing it would be to kick back after a long day and enjoy the subtle warmth from the fire as you listen to the sea in the distance. The Newport Fire Pit table and many others can be ordered for commercial or residential use. Cooke Furniture specializes in the creation of stunning designer Fire Pit tables by using the finest quality materials such as stainless steel, acid washed copper and magnificent granite and marble from all over the world. Cooke furniture manufacturers all of it’s products in the USA and they can be customized to your exact needs and specifications. Contact Cooke Furniture today to discuss making your dreams a reality.